'Denver Post' Calls Out Its 'Vulture' Hedge Fund Owners In Searing Editorial : The Two-Way "If Alden isn't willing to do good journalism here, it should sell The Post to owners who will," the newspaper's editorial board wrote, as 25 staffers are laid off from the newsroom. 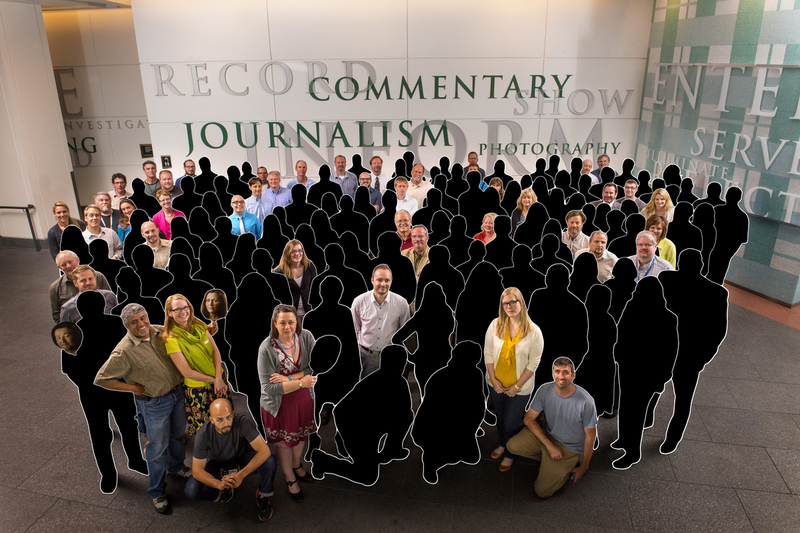 In May 2013, 142 newsroom employees of The Denver Post posed for a photo after the newspaper won a Pulitzer Prize for its coverage of the Aurora theater shooting in 2012. This illustration shows the original staff members who remain in April 2018. The Denver Post isn't the only newspaper to be bought by a hedge fund that then orders layoffs, shrinking the newsroom to a shell of its former self within a few years. But it wrote a new page of its history when it fought back in its Sunday edition, with an editorial and a package of opinion pieces around one central idea: Its owners are bleeding the Post, and Coloradans are going to miss it if it dies. "We call for action," the editorial declared. "Consider this editorial and this Sunday's Perspective offerings a plea to Alden [Global Capital] — owner of Digital First Media, one of the largest newspaper chains in the country — to rethink its business strategy across all its newspaper holdings. Consider this also a signal to our community and civic leaders that they ought to demand better. Denver deserves a newspaper owner who supports its newsroom. If Alden isn't willing to do good journalism here, it should sell The Post to owners who will." Above the editorial was a striking photo illustration: first, the newsroom's journalists in 2013 — and then the same image, with those who are now gone rendered in black. The newspaper's owners have "embarked on a cynical strategy of constantly reducing the amount and quality of its offerings, while steadily increasing its subscription rates," the editorial continued. "In doing so, the hedge fund managers — often tellingly referred to as 'vulture capitalists' — have hidden behind a narrative that adequately staffed newsrooms and newspapers can no longer survive in the digital marketplace. Try to square that with a recent lawsuit filed by one of Digital First Media's minority shareholders that claims Alden has pumped hundreds of millions of dollars of its newspaper profits into shaky investments completely unrelated to the business of gathering news." Alden, a New York City hedge fund, bought the newspaper chain that includes the Post in 2010. Denver's other daily newspaper, The Rocky Mountain News, stopped publishing in 2009 after 150 years. Digital First Media owns 97 publications, including the San Jose Mercury News, the Orange County Register, the St. Paul Pioneer Press and the Boston Herald, which it bought in February for just under $12 million. Last month, the Post said it would be cutting 30 newsroom jobs in the coming months; 25 journalists are being laid off Monday. At its height, the Post's newsroom counted more than 250, it said; it will now have fewer than 75 journalists. It has won nine Pulitzers in its 125-year history. "These job losses are painful, and we know meaningful work will not get done because talented journalists have left the organization," Editor Lee Ann Colacioppo told staff in an email when the latest cuts were announced. "I'm sure some commenters will cheer what they believe is the eventual demise of the mainstream media, but there is nothing to celebrate when a city has fewer journalists working in it." Joshua Benton, the director of Harvard's Nieman Journalism Lab, said at the time of the Herald sale the chain was known for cutting newspaper jobs. "If they're the winner, there's a real concern about the stability of the journalistic operation [of the Herald] going forward," Benton told WBUR. Requests for comment on Monday morning from Alden Global Capital and Digital First Media were not immediately returned. The Post's editorial page editor, Chuck Plunkett, was behind the collection of articles, The New York Times reports: "Before posting it, Mr. Plunkett said, he did not warn executives at Digital First Media. The Post's news and opinion sections are separate fiefs, and he also did not inform the paper's chief editor, Lee Ann Colacioppo, of his plans." "I had to do it because it was the right thing to do," Plunkett told the Times. "If that means that I lose my job trying to stand up for my readers, then that means I'm not working for the right people anyway." The cuts come as Denver itself has experienced a population boom in recent years. Denver Mayor Michael Hancock voiced his support of the newspaper and urged a possible sale of the paper. "Proud of our flagship newspaper for speaking out," Hancock wrote on Facebook. "For a New York hedge fund to treat our paper like a mere balance sheet entry and not an institution that is a critical part of our civic fabric, is terribly short-sighted. I urge the owners to rethink their business strategy or get out of the news business. Denver stands with our paper and stands ready to be part of the solution that supports local journalism and saves the 125-year-old Voice of the Rocky Mountain Empire." A previous version of this story misspelled the name of the Nieman Journalism Lab as Neiman.